There is a new breed of personal computers on the market today, the Ultra Mobile Personal Computer (UMPC). One of the obvious sectors driving demand for these products is the military, where sensitive electronics are exposed to harsh environments. These UMPCs (also called ultra rugged computers) have also been used commercially in a limited capacity, but with the mobile device market on a steep incline, users are demanding a greater level of protection for their mobile devices. In January of 2000 the US Department of Defense (DoD) released standard MIL-STD-810F which is a very comprehensive guide for environmental engineering considerations and laboratory testing procedures. This MIL-STD-810F standard covers temperature, vibration, shock, EMI shielding, fluid contamination, etc. Stockwell Elastomerics has been “ruggedizing” electronics equipment for many years. The key to achieving a truly rugged component is in the materials. For example, if a device is exposed to extreme low temperature and dropped it will rely on the cushioning pad for protection. Traditional rubber material will firm up and pass the energy on to the internal components, ultimately leading to a device failure. A silicone foam material is a good choice for preventing mechanical shock and vibration in extreme temperatures, because silicone maintains cushioning properties below -80°F. Where fuel and chemicals may make contact with the elastomeric cushion, a closed cell fluorosilicone sponge might be the better choice. Stockwell Elastomerics has a wide range of materials to meet the most demanding ruggedizing requirements, including chemical resistant materials, soft sponges and foams for cushioning and damping, EMI shielding materials, open cell and closed cell products for dust and water sealing. 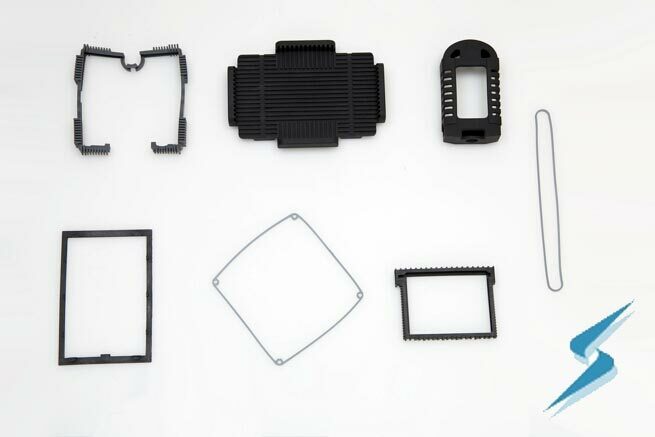 Production capabilities include custom molding, fast-turn water jet cutting, die cutting and adhesive lamination. For applications assistance or more information about gaskets and cushioning pads for ruggedized portable devices, please call Stockwell Elastomerics at 215-335-3005 or complete a contact form for assistance. Can you tell me more about castable elastomerics that are conductive?